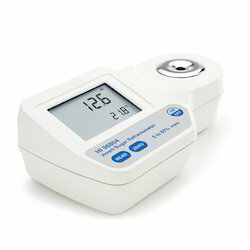 Bright Medi-Weld Appliances excels in rendering a qualitative range of Refractometer, which is offered to the clients at leading market prices. The Tools are highly appreciated by Construction Engineers, Professionals, Students, Researchers, Govt.Agencies etc. We have a range of latest Engineering Tools which are Simple to use, Less Time Consuming, Accurate & suits your application. This instrument is designed to control the concentration of saltwater, such as in cooking or rinsing seafood, and utilizes a new material that is durable against salty and acidic samples. International Protection Class:IP65 (except eye piece) Dust-tight and Protected against water jets. The MASTER-S10M is a good alternative choice when the water resistant feature is not a priority and the Temperature Compensation will be carried out manually. The units can be used for controlling the concentration of saltwater used in rinsing seafood or salinity in cooking. NEW material (which is durable for salty and acid sample) is adopted. The MASTER-S28M is a good alternative choice when the water resistant feature is not a priority and the Temperature Compensation will be carried out manually. The units can be used for controlling the concentration of saltwater used in rinsing seafood or salinity in cooking. NEW material (which is durable for salty and acid sample) is adopted. International Protection Class :IP65 (except eye piece) Dust-tight and Protected against water jets. 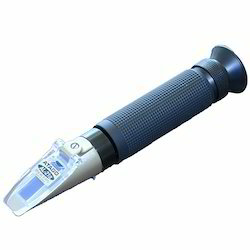 This refractometer can be used for measuring the concentration and freezing temperature of ethylene glycol and propylene glycol. 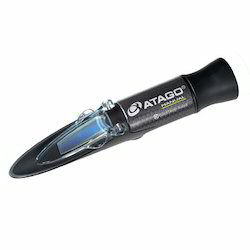 The PEN-PRO has a measurement range of Brix 0.0 to 85.0% which can be used to measure almost any sample. There are 2 ways to measure with the PEN-PRO. Either dip the tip into the sample and press the START key OR press the START key and touch the tip into the sample. There is also the new feature to perform continuous measurements. 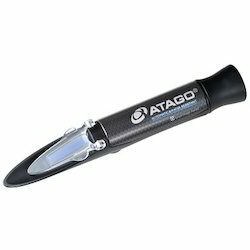 The temperature range of the "Dip-Type" Refractometer PEN-PRO has been improved from 60°C to 100°C. No more wait ! 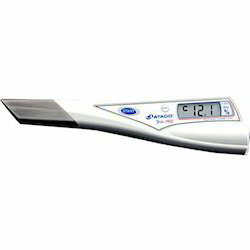 Measure hot samples while in the cooking process, such as soups and sauces. International Protection class: IP65 Dust-tight and Protected against water jets.